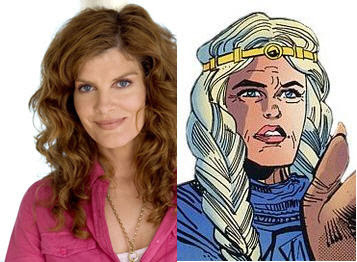 Kryptonian Warrior: Rene Russo Joins The Cast Of Thor! OK so it may not be as fantastic news to everyone as it is to me, but I'm a one very happy bunny... One of my major childhood crushes - Rene Russo has been cast in the part of Frigga (also known as Frigg): Queen of Asgard in the new Marvel movie Thor. Rene will star alongside Chris Hemsworth (Thor), Tom Hiddleston (Loki), Anthony Hopkins (Odin), Natalie Portman (Jane Foster), Stuart Townsend (Fandral), Tadanobu Asano (Hogun) and Ray Stevenson (Volstagg) among many others. Kenneth Branagh will direct the film, which will be released on May 20, 2011. The Thor cast is growing at a rate and quality that I'm more than happy with so far, let's hope this carries into the Captain America movie and we get even better actors appearing in that. Russo may not be everyone's cup of tea but to me she's quality... The pic below is one that adorned my teenage wall with some mighty admiration for years. Hot momma!